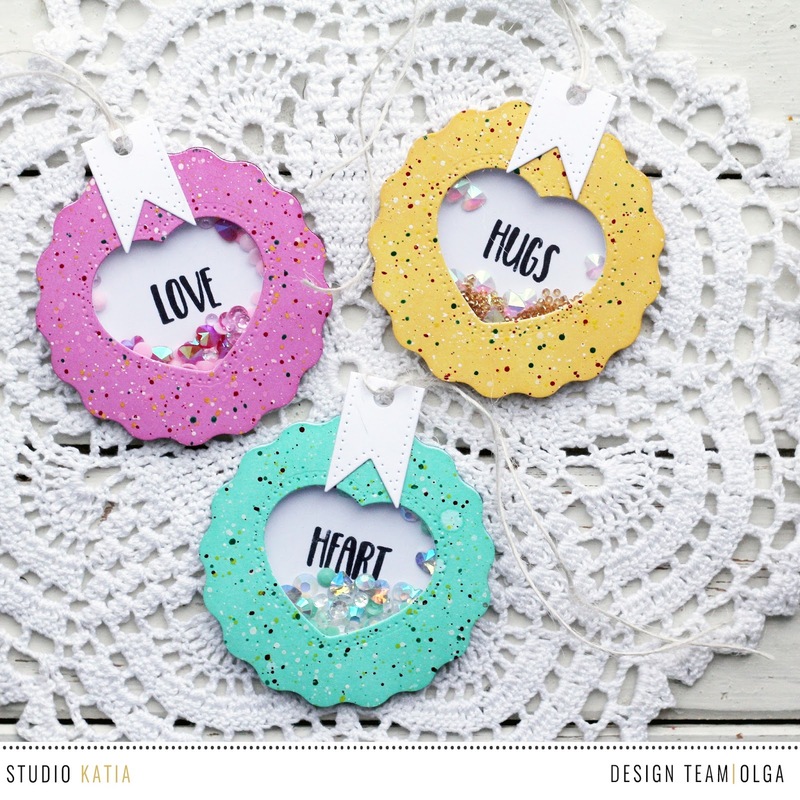 Olga Moss : Studio Katia December 2017 Release Blog Hop + WINNER! 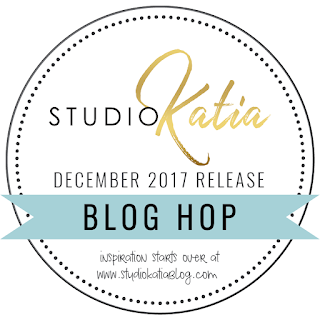 Studio Katia December 2017 Release Blog Hop + WINNER! 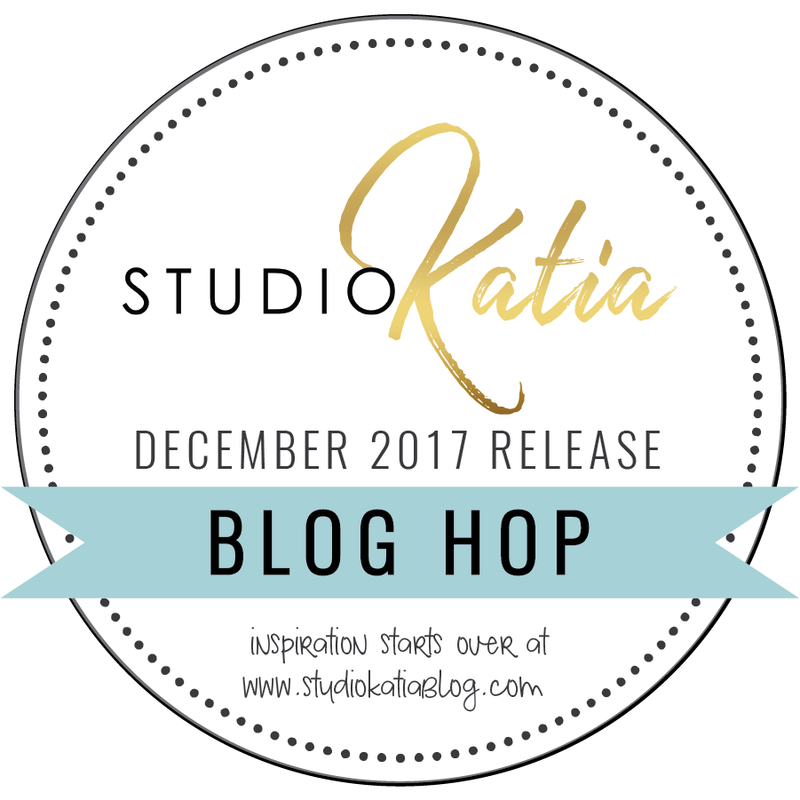 Hello and welcome to Studio Katia`s December 2017 Release Blog Hop! You are here from Kathy Racoosin`s blog and now my turn to introduce my projects for today. I am so honored to be a part of this hop. Yay! And our newest release has arrived and available for purchase! For today I have prepared two projects. Let's look at them. It's a card and 3 Valentine tags. I'd like to share a flap fold love card. I used the Kobi's Hugs & Kisses stamp set from the new release, and combined them with the new Dotted Patterns: Mini Tags 1 Die-namics. As always I started with preparing all details of the card. I stamped and colored this super cute stamps, cut them all. The last step was to make the shaker background: I cut a doily in the middle of the card base and folded it into 2 parts. Then I sponged it with two shades of pink inks, added a scallop border cut (using Dotted Patterns: Scallop Frame | Creative Dies) along the bottom edge of the front. Then I added multi-colored splashes of watercolor. So my background began to look festive. After I embellished it with the images from the Kobi's Hugs & Kisses | Clear Stamp Set. Lastly I made a shaker. 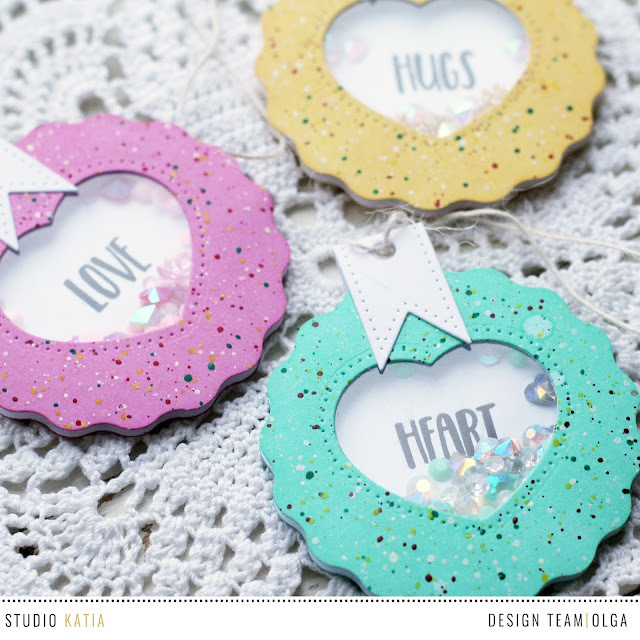 I cut in the middle of the doily heart shape using new Dotted Patterns: Mini Tags 1 | Creative Dies and filled the window with Iridescent Hearts | Crystals and Cupid's Kiss Crystals | Mix. Shaker I glued on the empty space to the top of the card. Sentiment "I love you" is taken from the And the Fox Says stamp set. In addition to the card I made a super quick Valentine tags, which my son then give it to his girlfriends. To celebrate our December release, we are giving away $50 gift certificate to two lucky winners! The winners will be chosen from comments left on Studio Katia blog. - Follow us (@studiokatia) on Instagram. Hi everyone! Just dropping in today to announce the winner from the Studio Katia`s December 2017 Release Blog Hop. Thank you all for leaving all the lovely comments. I enjoy reading every one of them! Congratulations Carol! You are the winner for a $20 GC to Studio Katia. Be sure to contact me at olgamosss26@gmail.com with the subject line Studio Katia`s Release Blog Hop Winner to claim your award! 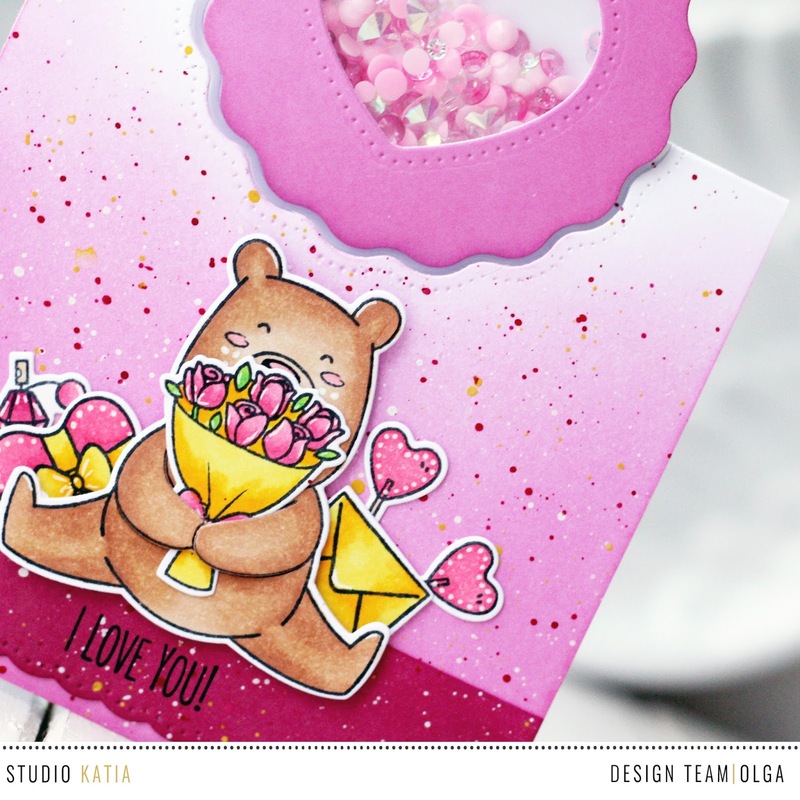 Fun creations--I really like how you made the speckled backgrounds and the little bear is absolutely adorable! What a great idea, I love the tags also. Oh my gosh, these are all so cute!!! Aww, that little bear is adorable and I love the way you popped the heart up at the top. The little shaker tags are perfect! Very cute tags. Thanks for sharing. Such creative shaker projects ! Love the tags! Your card is so precious! The images are so sweet and I love the color and your design! Oh my!!! I'm melting down for the cuteness of your card and tags!!! Too sweet!!! What a great idea Olga (your card.) This is so sweet and very pretty. Your tags are fantastic also. I am a huge tag lover so I am sure to make some of these. TFS! The bear is sooooo cute and love the shaker idea! LOVE this! I especially love your multicolored speckles... they look like confetti, which makes me smile! Wonderful Valentine shaker tags and card! Thanks for the instructions! Gorgeous card and shaker tags. Grat job! 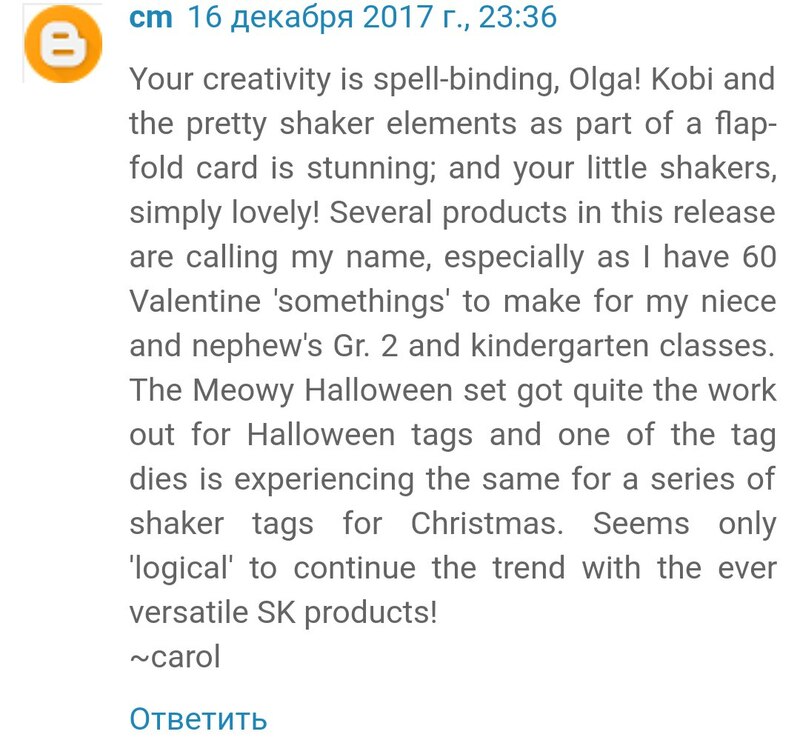 Your creativity is spell-binding, Olga! Kobi and the pretty shaker elements as part of a flap-fold card is stunning; and your little shakers, simply lovely! Several products in this release are calling my name, especially as I have 60 Valentine 'somethings' to make for my niece and nephew's Gr. 2 and kindergarten classes. 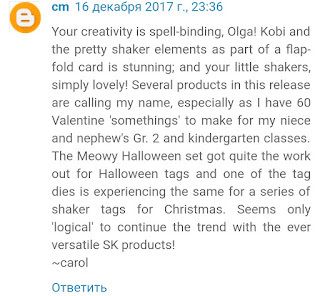 The Meowy Halloween set got quite the work out for Halloween tags and one of the tag dies is experiencing the same for a series of shaker tags for Christmas. Seems only 'logical' to continue the trend with the ever versatile SK products! So sweet and so so cute! The design of your card is wonderful. So very creative. It’s beautiful. I love the little tags too. Love the colours you chose for the shaker tags. And your card is so pretty in all those pinks. Thanks for the inspiration. These are fantastic! Love the shaker at the top of the card! I had never thought about making a shaker that extended beyond the edge of the card, but I love how this turned out. That plus the adorable little bear holding the bouquet? Just the perfect little card. I now want to go and make one immediately for my nieces. Thanks for sharing this fantastic idea with us! Awww...these are so creative and sweet. I especially like how you put the shaker element at the top. Happy happy holidays! cute card and cute tags! love the splatter look here. Fabulous shaker card and tags. Love the pretty colors. Super sweet and just darling with the bear! Love the heart shaker, too!